At Splash Dive Shop in Placencia, community commitment is more than a slogan. Patty Ramirez, co-owner of Splash, leads by example. Part of Splash's Mission Statement is to raise higher awareness in the community and to create a working culture that develops and advocates sustainable tourism practices. Sustainable tourism is critical to the ongoing viability of Placencia as a vacation destination and to the health of the local ecosystem. 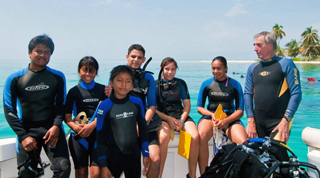 Diving or doing adventure tours helps Splash support these programs. We also welcome the participation of our clients to support these programs. Patty started a program called Splash Kids Club where local Belizean kids whose parents cannot afford scuba diving lessons can learn to dive for free. Splash has done 150 certifications from open water to Dive Master to date. Two of our “graduates” now work for Splash Dive Center and a third one used his Dive Master qualification to help him enlist in the US Navy. It is our hope and our goal to continue our program so that more children learn to dive and that more of them become dive masters and instructors so that they can have the opportunity for careers in the dive industry. To date, this program has to been sponsored entirely by Splash but contributions from others in the form of books or financial contributions would be welcome. Better yet, sponsor a child! Patty is very committed to the many NGO's that support the tourism business in Placencia and in Belize. Patty is on the executive of the Placencia Tour Guides Association and secretary of the Tour Operators Association. She is pleased that the Whale Shark Day has been merged with the Earth Day when Splash organizes the annual cleanup of marine debris that washes up on Laughing Bird Caye, a national park and a world heritage site. Ralph and Patty are “Founding Fathers” of the Placenca Tourism Business Organization, a NGO with the mission to protect, preserve and promote Belizean, locally owned businesses. Splash is very committed to the protection and preservation of the reef environment in Belize, and to protect the health of the Belize barrier reef. Patricia Ramirez is an active member of Placencia Mooring Masters, an organization that uses funds that it raises to install mooring buoys at the popular dive sites to protect our reef from anchor damage. Splash Dive Shop has sponsored one of these buoys at Laughing Bird Caye (National Park and World Heritage Site) on the very popular and appealing dive site known as Coral Gardens. Splash has also provided funds to purchase a second buoy which is waiting to be installed. In addition to protecting the environment and reef, programs like this benefit the community and the attitude of the community to support sustainable tourism so that future generations will be able to enjoy the beauty of Placencia and environs. Splash Dive Center has and will continue to contribute to additional mooring buoys at popular dive sites in the Placencia area by providing dive boat time, scuba tanks and manpower. Mooring buoys are also required at popular mooring sites for the many sailing vessels that visit Placencia's cayes as well as on dive sites on the reef. Any donations clients make to this important project to protect our marine environment will be greatly appreciated. You can get additional information by going to www.placenciabreeze.com and searching for Placencia Mooring Masters or you can find Placencia Mooring Masters on Facebook by going to Placencia Mooring Masters (PMM), Placencia, Belize, Facebook. An NGO known as ‘Southern Environmental Association’ (SEA, formerly known as Friends of Nature in Placencia) manages whale shark tourism at Gladden Spit with active involvement of national stakeholders. Patty Ramirez, co-owner of Splash Dive Center, is an active member of the Whale Shark Working Group. A set of guidelines to ensure ecologically-sound practices has been developed and followed. All tour guides and boat captains must be Whale Shark certified and carry their Whale Shark ID in addition to their Tour Guide ID. The guidelines and other information on the Whale Shark Working Group can be found at www.seabelize.org. Visitors to Placencia are encouraged to make a donation to this very worthwhile NGO. Splash will be happy to personally guide you to their office. If you are a Rotarian, please try to attend one of their meetings every Tuesday at 12:30 at Yoli's. Ask for directions at Splash Dive Center. The Placencia Rotary Club has taken the lead to establish the very much needed Placencia Volunteer Fire Department and responds to the needs of our community and surrounding areas in so many other ways. Ralph Capeling, one of Splash Dive Centers co-owners, especially wanted to improve the medical facilities in Placencia, so he donated $22 500.00 to the Placencia Rotary Club to buy equipment to upgrade the Placencia Medical Clinic. Ralph was able to get the assistance of two Canadian doctors who also contributed to this and purchased the equipment to make sure it was fit for purpose for the Placencia Medical Clinic. The Placencia Medical Clinic is open to all visitors as well as local people at no charge but donations paid directly to the Clinic would be very much appreciated. Splash Dive Center â€œ Putting your satisfaction, our community and environment, first!! !